There is nothing conventional about special elections to fill the congressional vacancies made by Trump’s appointments. Alabama’s Republican run-off election to fill Jeff Sessions’ Senate seat was no exception. The controversial Alabama judge Roy Moore handily won the nomination and will now face Democrat Doug Jones in the general election this December. Last spring, Luther Strange was appointed to fill Sessions’ vacant seat temporarily. He faced nine challengers in the August primary, triggering a run-off election, which usually occurs in states where candidates don’t achieve a plurality of the total vote. Strange, as the incumbent, placed second with 32.8 percent behind the ultra conservative and controversial Roy Moore with 38.8 percent. Moore consistently maintained a double-digit lead over Strange in the polls the entire campaign. The Republican run-off was more about personalities rather than the substance of policy. In a state like Alabama, which still ranks atop the biggest Trump supporting states, this bitter election divided the Republican base along familiar ideological fault lines. Presidential coattails and incumbency advantage can be helpful factors in Congressional elections if the circumstances are right. This was an unusual, and possibly, a premature test of those factors. With the electorate’s mood still decidedly anti-incumbent and anti-establishment, the challenge for incumbents rests in their ability to persuade voters that they are, in fact, not the “establishment” even though they are no-longer a political challenger. Despite his short stint in the Senate, Strange was pegged the establishment Republican candidate. Moore was a firm favorite among grassroots and religious conservatives with solid support in Alabama’s sprawling rural communities outside of Huntsville and Birmingham. Moore’s local popularity drew endorsements from a broad swath of national anti-establishment opinion leaders including Sarah Palin and former White House advisors Steve Bannon and Sebastian Gorka who all stumped for him. A report in Politico suggested Strange’s private polling showed him with a more competitive margin than public polling data, which procured support from outside groups and deep pocketed PAC funds linked to establishment figures like Mitch McConnell. 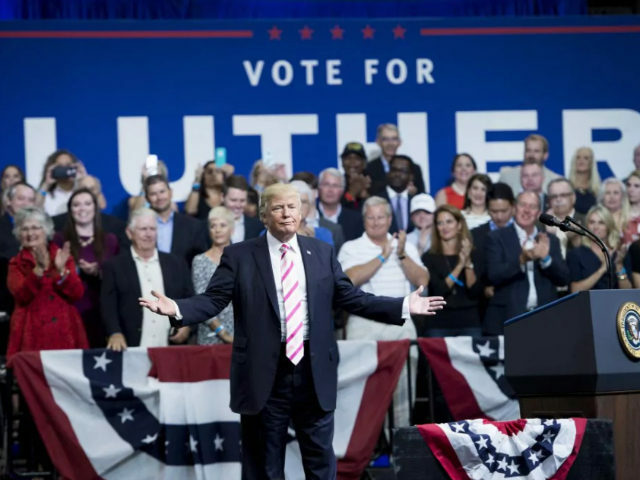 President Trump rewarded Luther’s perceived loyalty as the Republican incumbent with his endorsement coupled with a 90-minute rally-styled event in Huntsville. Over the weekend, Strange frenetically embraced the President’s endorsement, donning the iconic red “Make America Great Again” hat at rally stops as a show of solidarity with a popular president among Alabamians, and possibly, to win over a few undecided voters. All was for not though when President Trump all but withdrew his endorsement Monday evening at a dinner for conservative activists. In what might what have felt like a betrayal that sealed Strange’s fate, this serves as a stinging reminder that incumbency advantage yielded no benefit in this political environment. The president’s coattails are young and anti-incumbent sentiment is still strong within the Republican electorate. Political challengers are advantaged in the current political climate. It is simpler to put all incumbents into the same “establishment” category. Trump now faces political challenges if he acknowledges he backed the wrong horse, raising questions of if and/or how he’ll claim victory.